Where to place those email signup boxes . . . I hear this story often. Is this you? In that case, read on gorgeous. The dull-looking, hidden-in-corner kind is boring. The in-your-face kind is annoying. “Subscribe to the newsletter” won’t cut it. Waiting around with your feet up won’t get the party started. This blog post will talk about the actual signup box (point 1), but in the video above you have information also about transmitting value and spreading the word. What is a signup box? Because you have visitors who love what they see on your website, but they are not quite ready to contact you (not the right moment to commit, maybe some fears etc). You want to know who they are, which is why getting their email address is handy. When they sign up, you can feel assured that they enjoyed visiting your website, and you can stay in touch with them via email. What should the signup box look like? I’ve seen some terrible ones. No design, nothing to make signing up look like fun at all. Would you want to put your email address into this? What solution are your visitors interested in that is worth giving their email for? Using a Call to Action like Subscribe is a bit dull. Some alternatives out there are I want in!, Yes, please!, Join the community, but don’t be afraid to go creative! Personality and humor go a long way! This is your most visited page, so definitely place a signup box there. It should be visible in the part of the screen that visitors see before scrolling (because some visitors won’t scroll). If someone reads your entire blog post, you can assume they like it, and may want to be notified when your next blog post is published. 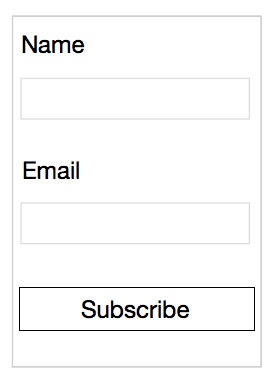 In the “old days” signup boxes were embedded (a form that is placed in-between the text content), but with the short attention span online, visitors don’t pay much attention to them anymore. Website owners then started using the popups to ensure their signup boxes were not ignored; flash in your face the moment you visit their site. (Luckily Google is now giving lower SEO ranking to websites who uses these. Read more about that in my Facebook group post). … so what is an “anti-pop” person to do? I like this one for blog post pages. It pops up when the visitor has scrolled a certain % down the page, and I set it to 100%. If a visitor has scrolled through your entire article, it will pop up just as they finish reading. No interruption 🙂 . An exit popup is triggered by movement, so when the mouse moves towards the closing X in the browser window, the popup activates. If the visitor is not interested, he/she was about to close the window anyway, so annoyance factor is low or non-existent. What’s your feeling about signup boxes and its purpose and process in general? I would really like to hear your view on it. Share in the comments! Need to build your list? I absolutely recommend Natalie Lussier’s 30-Day List Building Challenge. You can find it on her homepage (where you get to experience the click popup!). It covers everything – from finding your best freebie gift for your signup box to bringing in the subscribers! Love this! I finally understand what it’s all about!